Greatest find inspires new drama Jump to media player The "Staffordshire Hoard" inspires a series of plays to be staged at London's New Vic Theatre. Staffordshire Hoard inspires drama Jump to media player A festival of drama inspired by the Staffordshire Hoard is to be staged throughout the summer. New Staffordshire Hoard display open Jump to media player About 300 items from the Staffordshire Hoard have gone on show in a new gallery at Birmingham Museum and Art Gallery. When archaeologists were digging in a Staffordshire field back in 2009, little did they know they'd made the discovery of a lifetime. They uncovered the largest collection of Anglo-Saxon gold and silver ever found, anywhere in the world. 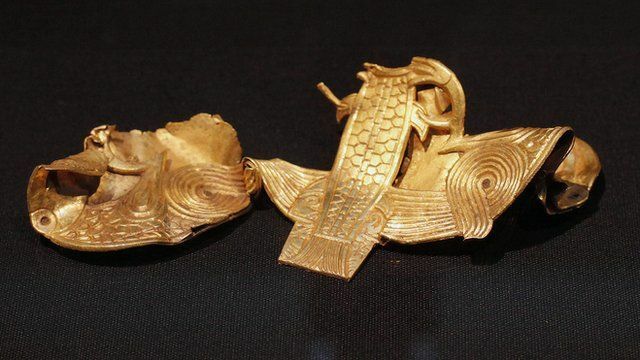 It's known as the "Staffordshire Hoard", and has inspired a series of plays which are about to be staged at the New Vic Theatre in Newcastle-under-Lyme, Staffordshire. BBC Breakfast was joined by Theresa Heskins, the New Vic's Artistic Director, and by the archaeologist and curator Deb Klemperer, who visited the hoard site during the first week of its discovery.